Prairie Landing in West Chicago is a 4-1/2 star (Golf Digest Places to Play) Robert Trent Jones design that incorporates contoured fairways, innovative bunkering, abundant waterways and wetlands among massive sweeps of native grasses that combine to create a truly memorable golfing environment. From the moment we stepped into the clubhouse, we understood that this would be a special golf experience. The facilities here are expansive, and include a pro shop, locker rooms with showers, and banquet/outing arrangements that can accommodate up to 200 people. Outdoor tented ceremonies can be hosted on the 19th Tee Box, and the Sunset Verandah is perfect for cocktail receptions. A spacious restaurant/lounge features lunch items and beverages, with the picture windows providing wonderful views of the golf course. 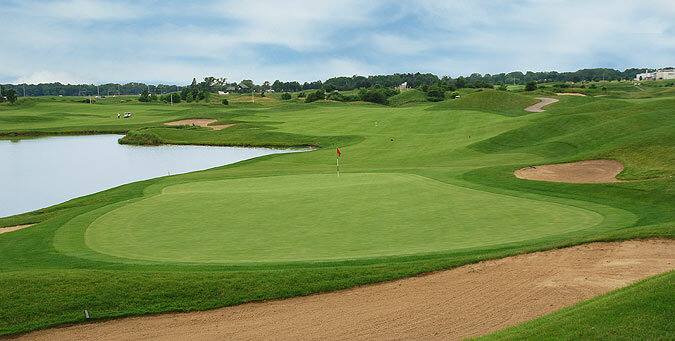 Unique to Prairie Landing are the incredible practice facilities available here, including a nine hole putting course, a nine hole chipping course and 2 par four practice holes - the use of which is all inclusive in the paid green fee! 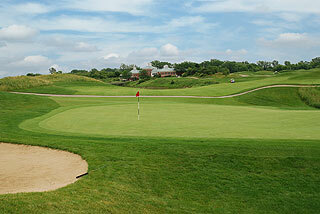 There also is a separate putting green and a spacious driving range with mats and grass tee stations. Golfers can visit to practice only, paying a $30 fee for three hours of usage. Eventually, the set up will provide golfers with an opportunity to hit some balls, play the putting course, then one of the par four practice holes, followed by the 9-hole chipping course and finishing with the last practice hole. The quality of conditioning and aesthetics match those found on the golf course - which is pretty darned good! This facility is recognized by most as the Chicago area's finest. 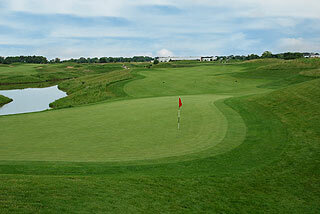 In addition, the Prairie Landing Golf Academy provides a variety of lesson programs taught by a professional staff. The golf course features rolling bent grass fairways, strategically placed sand bunkers, and high quality, quick & mildly undulating putting surfaces that are above average in size. Golfers can choose from 5 sets of tee boxes - measuring 6950/139 slope rating, 6572/135 slope, 6092/129 slope, 5570/126 slope for women & 123 slope for men, and 4859 yards with a 118 slope rating. Cart paths are marked to the center of the green, and yardage blocks are also provided for on the fairways. 125 yard barber poles are measured to the center of the green. Walkers receive pin placement carts and riders can take advantage of the Par View GPS located on all carts. The average golfer will find plenty of challenges from the mid (Blues) tees, though no par four will exceed 400 yards from these areas. The front nine is quite open and provides a links feel with rolling terrain and fairways frequently bordered by water hazards. The opening hole is tight off the tee, with the preferred landing area past and left of the 125 stake. The approach from here will have to carry the hazard. 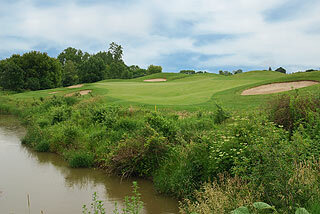 Number two presents a rolling, elevated fairway with a meandering stream short right. Bump and run entries can be played from the right, but anything left of the green will find a challenging collection area. The par three 3rd plays over a grass gully to a well bunkered putting complex, with some bail out room on the left. The sculpted tees on four lead to an ample fairway with a water hazard coming into play on the right about 150 away. 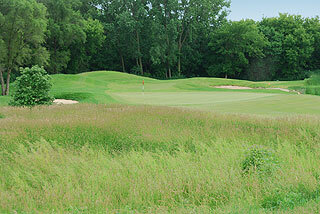 The green is surrounded by bunkers and grassy swales, and is best approached from the left side. The par four 5th doglegs left and presents the option of two fairways to drive to off the tee. The right side is the safe play, but leaves a challenging approach over a water hazard and vegetation. Long hitters can drive one over the edge of the hill on the left side, with the reward being a wedge approach to a rather smallish putting surface. There is plenty of room in the collection area right of the green on the par three 6th, which precedes the longest hole of the day - the 595 yard par five 7th. The tee shot must carry a stream that crosses the fairway, then winds its way down the left side for the length of the hole. The roller coaster fairway slopes right to left, towards the hazard. Swales and ridges define the putting surface which rests on a perch high above the stream. The eighth is a beautiful par four that plays over a gully to a very rolling fairway. An accurate approach is necessary, as mounds and bunkers protect greenside. The finishing hole on the front side invites the grip it and rip it mentality, with the left center fairway being the preferred landing area. A lake comes into play short right of the green, with the clubhouse providing an outstanding backdrop. The tenth hole is the first of 3 par fives on the back side, and is very score-able. There is plenty of room from tee to green, but do not be long on the approach. Eleven is much tighter, with trees bordering the fairway and a wetland that crosses 100 yards away, and also defines the right side. 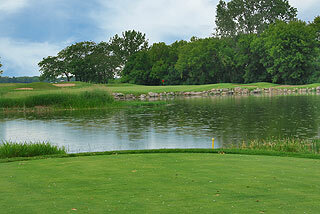 The 219 yard par three 12th demands a carry over a lake, though the water is eliminated from play on the red tees. Thirteen is flanked by trees left and mounding along the right side that may funnel slightly off-line shots back to the fairway. A creek crosses about 105 out, but there is ample room greenside on the course's # 2 handicapped hole. The putting surface on the par three 14th is well protected on the right by a cluster of sand bunkers, but this area is preferred to the wetland area on the left side -which is trouble. Prairie grasses and fescue covered mounds border the 15th fairway, which invites a bump and run approach from the left portion of the green complex. 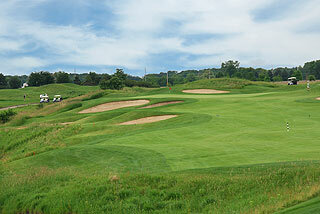 Number 16 plays a challenging 440 yards from the tips and is tough enough from the blue tees at 390 yards. Length is key here - with plenty of room on the wide fairway all the way to an open putting complex. The par three 17th plays long (224 from the tips) to the largest green on the course, which sits on a plateau with deep bunkering and fescue covered slopes. Par is good here. 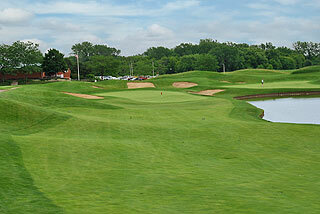 The closing hole winds around a lake bending right to left with the water in play about 200 yards from the green. It is important to miss the trio of fairway traps by aiming towards the right center, or by clearing the bunkers off the tee to the landing area approaching the 230 yard marker. The approach is tightly guarded by water short and left, and bunkers on the right. Prairie Landing is an intoxicating design, and one that links style lovers will surely appreciate. 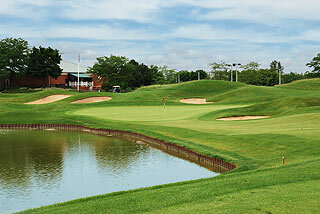 The facilities are outstanding, inviting golfers not only to enjoy a round - but to spend the day. Come early or stay late to take advantage of the high quality practice facilities - and the restaurant is open from 11AM providing the nourishment and refreshment needed to stay the course. Fees for the whole ball of wax, including golf, cart and use of the practice facilities tops out at $96 in season, with great weekday, twilight, senior and family rates available. Beginners can hone their games here, and experienced players will surely enjoy the beauty and challenge of Prairie Landing. For more info - visit out informational page on our Chicago Golf course listing section, with a link to the Prairie Landing web site - click here.